Last Wednesday morning I went to the MPH Distributors sale with my mum & my lil brother. We managed to find the place without getting lost at all because my mum,after all was a Sri Aman girl & grew up in Petaling Jaya,as we passed all of the places that were familiar to her,she pointed out bits and pieces like,Anwar Ibrahim’s old house,he used to live there & was in the same Rukun Tetangga as my late grandpa(but our huge family is of course Tun Mahathir’s supporter through & through).I even bought my mum recently for her birthday,the book of illustrations on Tun’s life & she loved it. I’ve been to various books warehouse sales.How else do I have more than 200 books in my room then? 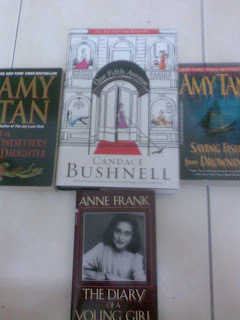 ?My favourite bookstore warehouse sale has got to be hands down,The Big Bookstore at The Atria Damansara.It’s the bomb!Their selections are amazing & that’s where I discovered Annie Hawes books & bought all of them. The second has got to be Payless Bookstore(where I discovered 2 writers that I’ve loved now for many years although they don’t write anymore, Fannie Flagg & Frances Mayes—I’ve ALL of their book,so if anyone wants to borrow just tell me!) warehouse sale because again,the selection are amazing & they have books that aren’t at MPH or Borders, books that are not current because sometimes there are great books by great authors but they’re not available at bookstores because their works are not recent. I’ve been to MPH & Times warehouse sales too.I’ve been going to them since I was what,16 years old?But I’ve to say that there has been numerous times when I went to MPH warehouse sale & they disappointed me.Though there were a few gems but it was mostly a let down.But because the sale was mentioned by my friend,my mum,I thought why not give it a try? 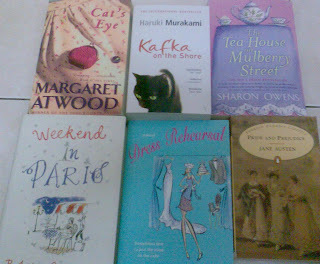 So I did & it was a let down.I even couldn’t find any books that was on Moja’s list that I said I would help him buy.The selection was more leaning towards young adults & the prices were not that ‘warehouse’ sale worthy.BUT,I manage to buy 4 great books after poring around & the total was rm54.My mum bought 2 books & my lil’ bro bought 1(men in my family are not that great readers..hurmph..).Now there’s only 1 book by Amy Tan that I haven’t read,The one hundred secret senses.Below are the pic of books that I bought. Friday morning, I went to Times Warehouse sale at Digital Mall USJ 19 because I know that it’ll be better than MPH.I went alone, because my dad had to go to KL & my mum wanted to stay home with my 2 lazy brothers. So off I went driving my dad’s car(cos’ he used mine),although I followed the correct directions that I saw on the net the day before,I got lost due to me being panicked,asking a restaurant owner for directions & he gave me the wrong one(because I forgot that there’s a Digital Mall at Subang Parade, which he directed me too..aiyoh!). So I texted Ad, since I remembered that he lives in USJ so turns out I was on the right path all along & if only I didn’t panic & continued on my path,I wouldn’t have been 30 minutes late to the place.aiyaaaa. This is all because my mum wasn’t there because usually when I get lost,she’ll be there next to me to calm me down. huhu.By the way peeps,the Digital Mall in USJ 19 is straight ahead after The Summit,you’ll see it on your left.I should have gone straight ahead instead of turning around & second guessing myself!!! Back to the Warehouse sale,it was superb!I pored over all the books,although their selections were many,the quantity wasn’t as much as MPH’s but they were far better in pricing their books & I even manage to find 2 books that were on my list---Kafka on the shore by Haruki Murakami & Cat’s Eye by Margaret Atwood! !Yesss..Only like 30 more books to go that’s on my hard to find list.haih...I also bought 4 others books.All 6 books =rm74.43.Woot!! !Here’s a pic of all of them below. Oh,I want to give a shoutout to Tomok for winning OIAM!I know Esther is talented & I’m a fan of her as well(I won’t comment on Aweera...kah22222)but Tomok to me & my mum(both of us voted for him many2 time during the finals) but to me,Tomok deserves to win because I mean come ON,look at the enormous amount of transformation that he went through! !I’ve to be honest,I wasn’t a fan of Tomok AT ALL before I watched him LIVE at one of the taping of OIAM(I think it was week 7 that I went). He sang Syafinaz’s song & I thought that was very bold & suicidal of him & he pulled through!I was like,is that the dude who sang the icky jiwang songs in New Boyz? ?hahah.And the fact that he sang Beyonce’s Crazy In Love & Rihanna’s Umbrella was a great shock.So for that,I was glad with this year’s OIAM winner.But I hope he won’t be cursed like the past 2 winner of OIAM who is much less popular now than OIAM second place(Faizal & Sheila both didn’t win OIAM but they’re waaaay popular than Suki & Ayu). I missssssss YOOOOOUUU babe! huhu. hanna..gue udah bilangin di hp kn?? xper2..lg a few weeks dh kene balik shah alam kn??? sgt setuju bout tomok itu!